Hankou Shashin: Shibarareta Shoujo-tachi no Mita Mono ha? Hankou Shashin: Shibarareta Shoujo-tachi no Mita Mono ha? 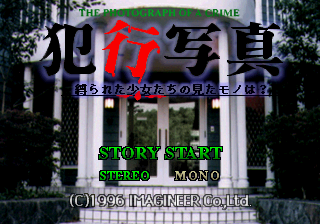 (犯行写真～縛られた少女たちの見たモノは？～) is an adventure game published by Imagineer for the Sega Saturn. Main article: Hankou Shashin: Shibarareta Shoujo-tachi no Mita Mono ha?/Magazine articles. README.DOC TXT 4,061 Messages from the developers.